It's in there - the xanthophyll. 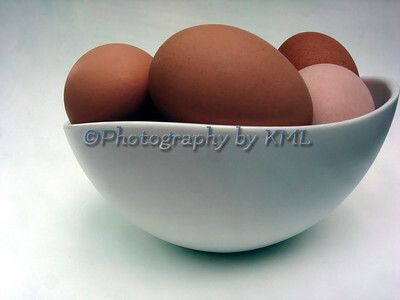 All eggs, even these hard boiled ones have it in them. Are you ready for what it actually is? The xanthophyll is the yellow carotenoid pigment that is in the egg yolk. I know it's a stretch for X this week, but it works, even if you can't see it in this image. In last week's post, one side of the bridge shows the canal that begins the lake. This is the view from the other side of the bridge - it's so different it doesn't even look like the same place. It is more of a swamp and it feeds into the lake through the canal on the other side of the bridge. 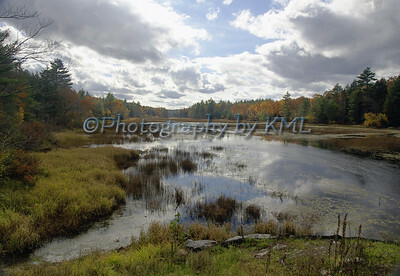 Once in a while you will catch a canoe in this swamp, but that would be about it for boats. There are no houses or docks on this side either. Just a big swamp that goes on for miles, connecting to a much larger one further down. Funny how the water systems are all tied together - all leading to their final destination - the ocean. Most people think of the weather as a conversation piece or starter - "Nice day today, don't you think?" Well, I am one of those weirdos who actually likes the weather. I love to keep track of the forecasts to know what is coming. 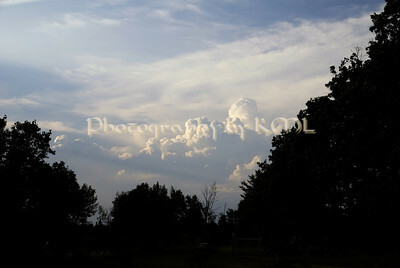 I love to watch the clouds, test the wind, read the temperature, and watch the barometer. I have a fancy little "weather station" right beside my computer so all my numbers and readings are right at hand. My internet browser has the 5 day forecast all lined up with all the necessary settings too. My kids know who to ask when they are looking for the "right" days for outdoor activities. And you know - this "weather" thing goes way back. I can't remember a time I wasn't interested in it. Guess I missed my calling - I would love to make those big bucks the weather men do - even when they are wrong! The lake that we so love to swim in during the summer is a man-made one. 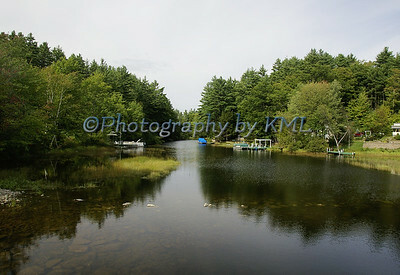 I have posted photos in the past of the dam end, but this canal is technically the beginning of the lake. I am standing on a small bridge here, and this is the view towards the lake. Just beyond those trees, at the end of the canal, it opens wide and becomes our lake. Next week I will show the view when I turn around on the bridge. It's very different from this side of the bridge. 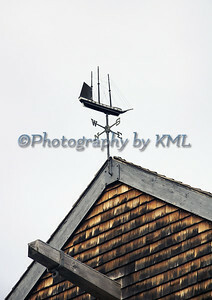 This pretty little weather vane caught my eye when we visited a park beside the ocean. Atop the old cedar shingled building, there was this little ship. With one sail up, and pointing towards the East. It's hard to see in this small image, but all the rigging is there on the masts. Quite an intricate little piece it is, and one of my favorites! Either we were there that day before the boats were put in the water for the season, or they had already left for a day on the water. It was odd to see them deserted. 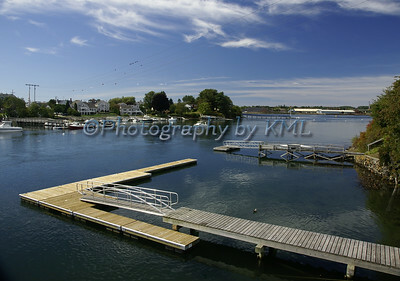 These docks used to belong to lobstermen - they were always lined with rows of lobster traps piled high. The last few years we have driven by on our ocean visits, those traps have not been there. And the boats have not been lobster boats alongside those docks. These shores have been slowly changing over the years, and this is just a part of it. The boys have spent many summer mornings, afternoons, and evenings doing some fishing under these bridges that cross the Great Bay in NH. This is the view we got when we went down to the ocean about a month ago. We didn't expect to find them totally rearranging the shore line and working on the very old rusty bridge - the one in the background. The old one has been off limits to all traffic for many years - we thought they would eventually dismantle it before it started falling into the water. But they have other plans, and I can't wait until they finish it. It is being restored for pedestrian and foot traffic only. It will be so cool to walk over that bridge - the only other way to get to the other side is on the new bridge where the cars go 55 miles an hour, and no pedestrians are allowed on it. It will be a fine walk with the camera. I have done many photos under it, but never from on it. New views and perspectives from above - too exciting! 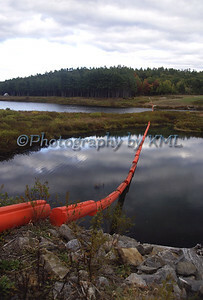 The bright orange boom at the dam is ready and waiting for the waters to rise. It stretches from one end of the canal to the other. As the water rises, it floats up. It's main purpose is to keep the debris that floats on the top of the flood waters from touching and piling up around the dam building. As the water lowers, the boom does also. 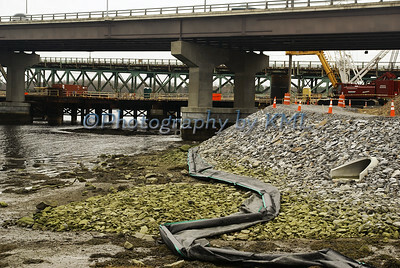 Once the waters are back to normal, the debris can be removed. I love the bright orange against the darkness of the day. 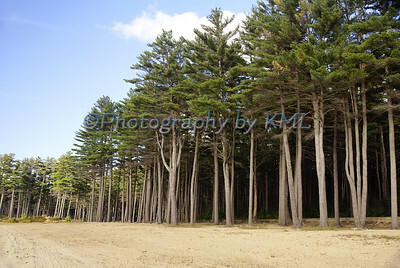 These tall pine trees line the edge of the beach area at a park beside the lake. Standing in the middle of them and being surrounded by these thin giants was quite an experience. See how the greenery is at the top? There is a reason for this. The park is part of the flood control system of dams that run through our state. Each spring this whole area is under water - most times only as high as those bare trunks. But I have seen it a couple of times where you couldn't even see any of the tree tops - they were all completely under water. The last time it happened was about three years ago, and so much damage was done to the structures in the park that it has had to remain closed to the public since then. The state has even put this piece of property on a list that it wants to auction off - there are no funds to put towards it's repair. Hopefully things will turn around before that has to happen - this has been a family spot for many years.